I completed two quilts for Siblings Together last year, Greenfields and Jewel Box, which were sent off at the beginning of June in time for gifting at the summer camps. The Greenfields quilt top (previously seen here) was paired with an orange polkadot backing and jade green binding. I machine quilted it with a simple grid of horizontal and vertical lines. Finished size 160 x 195cm. Completed 23/03/2017. You can probably see it was a bit of a windy day for photography! This one has a blue polkadot backing and a Kaffe Fassett vintage bead stripe for the binding. I machine quilted it outlining the diamond shapes formed wherever four half square triangles meet. Finished size 160 x 200cm. Completed 20/05/2017. I previously showed some of the blocks I made for other members of the bee in this post. The "bee year" runs from September to September and I have decided not to rejoin this time around, as I was struggling a bit for time and strangely fabric (no shortage of that as such, just that I never seemed to have the right colours/prints!). Quite a variety! I learnt that I struggle with the concepts of "wonky" and "low volume". I think the daisies and butterflies were the most fun to make! I made a (small) quilt entirely from leftovers in the space of a week. Seems unlikely I know, seeing as how I am usually the queen of procrastination! What is a quilter to do? Why, get to it and make another of course! The starting point was this pile of half square triangle units which were cut out with great enthusiasm back in 2009. They were destined for the double pinwheel quilt (in this book) but we upgraded from a standard double bed to a kingsize when I had barely started with the piecing. Because the design was set on point, I could not come up with a way of making the quilt bigger without fundamentally changing the design, so the whole project was shamefully abandoned! I did use a bunch of finished pinwheel blocks for Soy Amado last year but the rest got stuffed back in the bag from whence they came. I decided to use a free pattern by Melissa of 100 billion stars as my triangles were the right size and were (mainly) of two contrasting colour groups. The backing was pieced together from a couple of offcuts from larger quilts and the binding was salvaged from the scrap box (I had removed it from something else as it was too dark, but it was just perfect for this!). It turned out about 36.5" square, and is ditch stitched along all seamlines using red thread. I think the recipient is quite happy with it! Hello there! I can't believe how quickly time is flying by, 20th of February already and this is my first blog post of the year! I have decided that 2017 is the year I am going to attempt to face up to the scrap "situation" and to that end I am going to try to link up with Nicky and Leanne for Scraptastic Tuesday each month (yes I know I missed January altogether and that I am pretty close to the deadline for February, but I will try harder!). I started off by sorting out the rattiest, stringiest bits from the tangled scrap boxes (i.e. the least appealing bits) and found a good pattern in Kathy Doughty's "Making Quilts" book which looked like it would use a lot of scraps! So this is the completed top of my "Greenfields" quilt. It took me from 2nd of January until the 16th of February to complete, I think that there are a lot of pieces in there, but it doesn't seem to have made much of a difference to the scrap "situation"! It was a good opportunity to use up bobbins with weird coloured thread, and half empty one's too. This will be heading off to Siblings Together when it is finished. I have just ordered some backing fabric for it, so I can get it quilted in the next few weeks. Linking up with Nicky and Leanne for Scraptastic Tuesday, just in the nick of time! This turned out to be a quick little project! I saw the idea here, started joining 6.5 inch long scraps of various widths using them as leaders/enders whilst working on other things. Suddenly, almost before I knew it I had 9 blocks assembled and ready to become a little quilt. Curiously, I don't seem to have any fewer scraps though! I think it turned out pretty well, although I still can't seem to take a decent photo (always taken in a rush)! Again, a bit out of focus, but you get the idea! This is my first finish from this quarters FAL list - hooray! 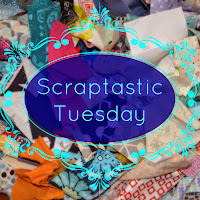 I am also linking up to Scraptastic Tuesday!